We all have an ugly coffee mug, a framed picture on the wall that we walk by every day without noticing, or a scarf that while treasured, is never worn. Even though a clutter-free life sounds appealing, some things are harder to let go of than others. We may hold on to different items, but we experience a similar struggle. When letting go, it helps to start with the easy stuff like duplicates, and things you know you won’t miss to strengthen your decluttering muscles. You’ll have an easier time when it comes to the more challenging things, but there may still be a few items that have a hold on your heart. Our heart strings are strong, but the following recommendations will show you how to get rid of clutter you care about. This is one of the most effective strategies for seeing what kind of value, if any, an item adds to your life. During our early stages of decluttering we had 3 vases on our bedroom bureau, each holding a flower that represented the flowers at our wedding. Sounds meaningful right? They were lovely, but I realized that I only noticed them when I was dusting them, or accidentally knocking one over. I wanted to see what it would be like to live without them. Would I miss them? I wrapped them up, placed them in a box, and put the box in the garage. I didn’t mention this to my husband. I kept waiting for him to ask about them, but he never did and after a few days, I forget about my treasured vases. Two months later I brought the vases back in and set them up on the bureau. I told my husband I wanted to donate them and he said, “No, I really like those.” When I told him they’d been in the garage for months, he agreed it was a good time to let go. A little separation goes a long way when it comes to parting with your stuff. 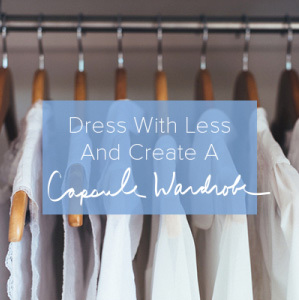 It’s why I recommend that people who try minimalist fashion challenge Project 333 put excess clothing aside for three months instead of donating it. It eliminates the fear of missing something or not having enough, and determines if it’s really our hearts holding on, or fear that is encouraging the tight grip. Use Marie Kondo’s suggestion from The Life-Changing Magic of Tidying Up and question your stuff. She recommends holding each item in your hand and asking, “Does this bring me joy?” I recommend creating a list of the moments that make you most joyful and when you ask your item if it brings you joy, compare it to your list. Does it make the list, or even come close? If the answer is no, Kondo says to let it go and be grateful for how the item served you. If your answer is yes to joy, try hiding it and see if you miss it. There isn’t any magic in getting rid of everything. If the ugly coffee cup makes you smile every morning, keep it. If your spouse wants to keep their ugly coffee mug, don’t push it. Put it through the tests above, and if you determine that you want it in your life, make space for it and appreciate it. We cannot compare or measure our lives based on what we do, or do not own. One of my yoga teachers told me about the first time he touched his toes, after years of practicing yoga and thinking he wasn’t flexible enough. After he finally connected fingers to toes he realized not much had changed. He was just a little more flexible. Letting go is the same thing. There is no magic in reaching a certain number of items or sacrificing something that brings joy to your life. 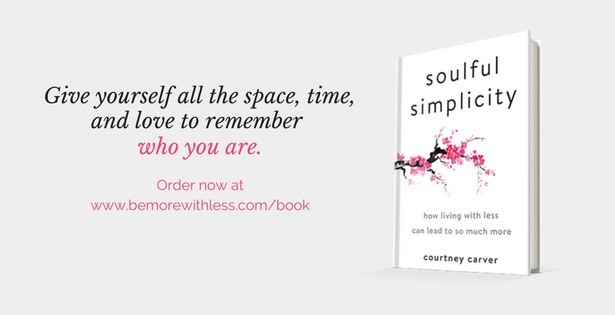 There are lessons in letting go and major benefits along the way, just like stretching and yoga, but be gentle with yourself and mindful about how living with less is changing you and bringing you closer to what matters most. The magic in reaching for your toes happens when you feel the stretch, whenever that may be. 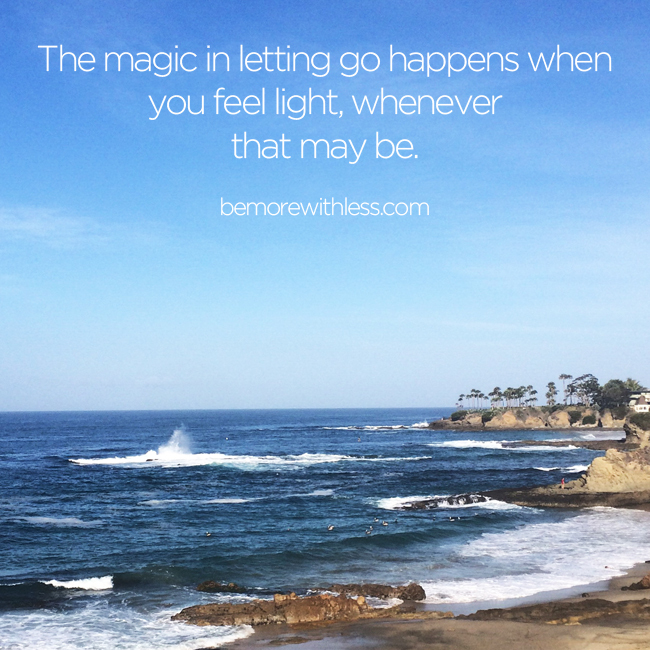 The magic in letting go happens when you feel light, whenever that may be. That’s a sensible, realistic approach. Thank you! I like the theme here immensely. Minimalism is a tool, not a goal or final end. In Zen we call the tools (meditation, koans, etc…) fingers pointing to the moon (truth). Often we confuse the fingers with the moon. Learn to free yourself and be happy. Dan, I love this comment! Thank you. What a beautiful way to say it. Also love this approach to minimalism. I started packing away treasured items and then displaying them (one at a time) on my dinning room table. I pass it every morning on my way into the kitchen. It makes me smile and brightens up the room (and my day). I try to rotate them out every month. That’s such a nice idea, Suzie! It honors those sentimental items without having the area be cluttery, and keeps it fresh so you still notice them. Hide it is so clever! I also love that we can keep it. Simplicity is a flexible, individual path. 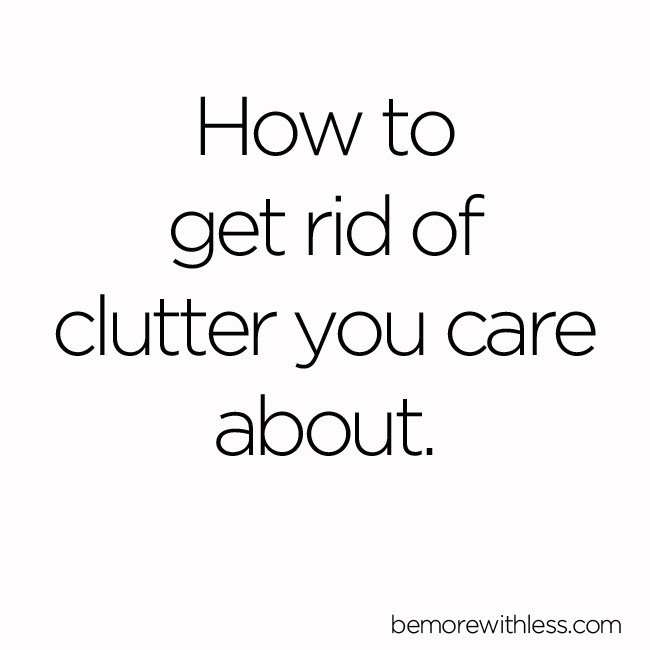 One of the ways that I have been able to get my family on board with decluttering is telling them that we are not going to get rid of anything that someone loves. The rule is “If you use it or it make you happy, it stays.” Usually, during a subsequent pass, we will have had time to think about these items, and are ready to let them go. I brought home some items to remember my mother when cleaned out her home to sell. She kept so much stuff, it overwhelmed me. I had to be sure some of these “things” were representative of her memory. I found the items that spoke to me and put them in one small suitcase. I am still combing through these items and finding excess that I don’t need. It is a lesson of being discerning and realizing that things can’t be shrines to your deceased loved ones. The memory and love is most evident in your heart. I have been putting things aside and leaving them be for a week or so. When I come back to them I find I’m much clearer in my thought process as to why I want to let it go or bring it back. I find the process a very positive one. Another tip Marie Kondo recommends is handling each item when deciding whether or not to keep it. I find that very helpful. I sort into yes, no and not yet. I may not give it up this time, but I’ll consider it again in the future. I also park things in the garage for a cooling off period. If I need it, I’ll bring it back up. If its still there after a few months, I’ll donate it. I love this post! Especially the line “There are lessons in letting go and major benefits along the way”. I wonder what lessons are in store for me? I’m at the stage where I’ve ditched a lot of the stuff I didn’t like, but want to cut down more, so now I need to say goodbye to some things I do like. Looking forward to feeling the stretch, and feeling light. Thank you Courtney. I have been decluttering for the past year or so and have been a faithful Project 333 member for as long. 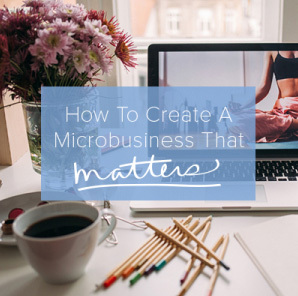 This advice will help me over the final hurdle of letting the last few things go. This post is so timely for me as I was just revisiting stuff I placed in the basement a year ago. I am surprised I continue to find things I can purge. Back then I thought I was done , I will revisit this again next year and I can’t wait to find what others things I kept and realize what was I thinking? I like the being gentle to myself part. I also put stuff away to see if I miss it. So often I don’t and I know better then to go back thru the box. Just let it go. I like the idea of setting something aside and seeing if you missed it. That seems very simple and practical. What a great way to bring a partner or child on board who may otherwise be resistant. After all, it’s easy enough to get something back out of the garage or box if you find that you want it as part of your daily life. The most recent trick for me was learning I keep things for who I wish I was instead of who I actually am. That’s helping me let go of some more things. I can no longer do project 333 because I no longer own that many clothes. Yea! Great post! This is why I like the term simplicity better than minimalism. Too often minimalism feels like the reverse competition you find in consumerism. Like it’s a race/competition to have as few things as you can, but mindless elimination serves just as littler purpose as mindless addition. The goal is to simplify, and so simplicity to me is a better term, since it keeps the goal in the forefront, and simplicity will vary by person :).